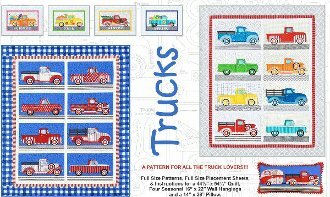 Trucks Quilt Pattern includes full size patterns, placement sheets, and instructions for a 44 1/2” x 54 1/2” wall hanging, and four seasonal 16” x 22” wall hangings. Instructions are also included to make a 14” x 28” pillow that combines the Trucks pattern with the Amy Bradley Designs Campers pattern. The technique is fusible applique.